Since all pieces are handmade in my art studio in limited quantities, it’s a good idea to check in with me before ordering. Please contact me to talk about your questions, order, payment, and delivery. Due to the work and noise in my studio, I may not be able to answer the phone every time. Please leave me a message, and I will call you back. 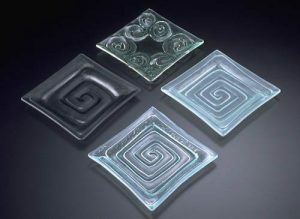 Recycled Glassworks is about the re-use of PLATE Glass, the type of glass that windows, shelves, doors, and tabletops are made from. Most of it is window glass that I get from contractors homeowners doing renovations or demolition. The dishes & bowls are made from ¼-inch tick, non-tempered plate glass. Sometimes I get old shelving units or tabletops to work with.